Shelf "Talkers" are designed to be easily fastened to your display shelving by various methods. They can display book title cards, store hours, store policies, cross-merchandise to other parts of store, special sales, quantity discounts, or rebate information. There are several methods of attaching the Shelf "Talkers" to your shelving. 1. PEGS: If your metal shelves have perforations on the top you can use plastic pegs (#772). 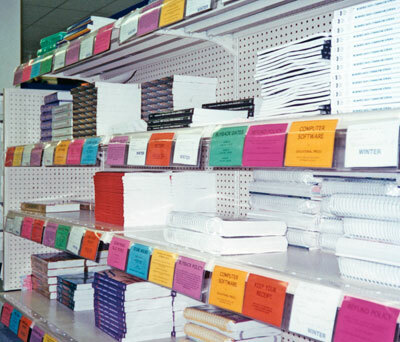 Place the flap of the shelf-talker on the top of the shelf and make a hole (using hole in shelf as template) through flap (using pen, for example) and insert peg. Each Shelf “Talker” requires two pegs. 2. MAGNETS: If there are no perforations, magnets are an alternative. The magnets (#762) are self-adhesive. Attach magnet to flap of Shelf “Talker”. 3. HOOK & LOOP: Attach velcro loop (self-adhesive #782) to top or face of shelf. Then attach velcro hook (self-adhesive #784) or velcro hook squares (self-adhesive #786) to back of Shelf “Talker”. You will need 5” of loop and 5” of hook (or two hook squares) for each Shelf “Talker”. 2. ADHESIVE SHELF “TALKERS”: Peel off the liner and attach Shelf “Talker” to face or top of shelf. Note: If you need to remove adhesive Shelf “Talkers” it may be difficult and the original surface of the shelf may not be “as good as new”.